A beautifully decorated porch is a gateway to the home and a place of relaxation and comfort. That’s why having porch decorations that reflect the style and personality of a homeowner is so very important. The porch is not only the first part of the home a guest sees, it’s also a living illustration of the homeowner’s true self; their heart, their soul, their style. 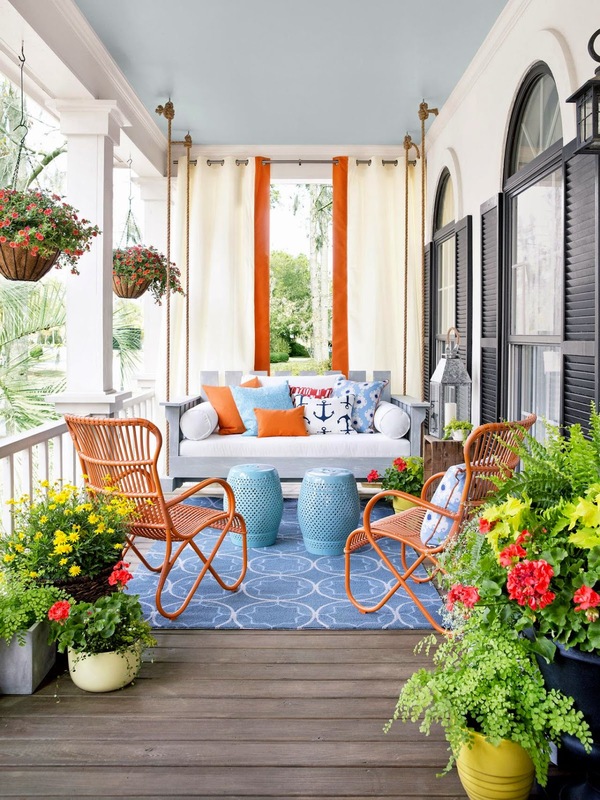 Here are some porch decoration ideas that are sure to inspire some winning decorative projects: we hope these gorgeous designs will inspire and delight you. Bring the indoors outdoors with porch designs that create a comfortable, functional living space. Use a simple area rug to define the space, creating an instant conversation area. For seating, use heaps of pillows to turn a stately porch swing into cushy outdoor sofa, making it a luxurious place to relax and unwind. Bright sunlight invites bold pops of color–contrasting periwinkle and orange tied together with a neutral grey–but if a little more shade is called for, simple canvas drapes will keep things cool on those sweltering afternoons. Round out your porch decor with mix-and-match planters filled with geraniums, ferns, and begonias. 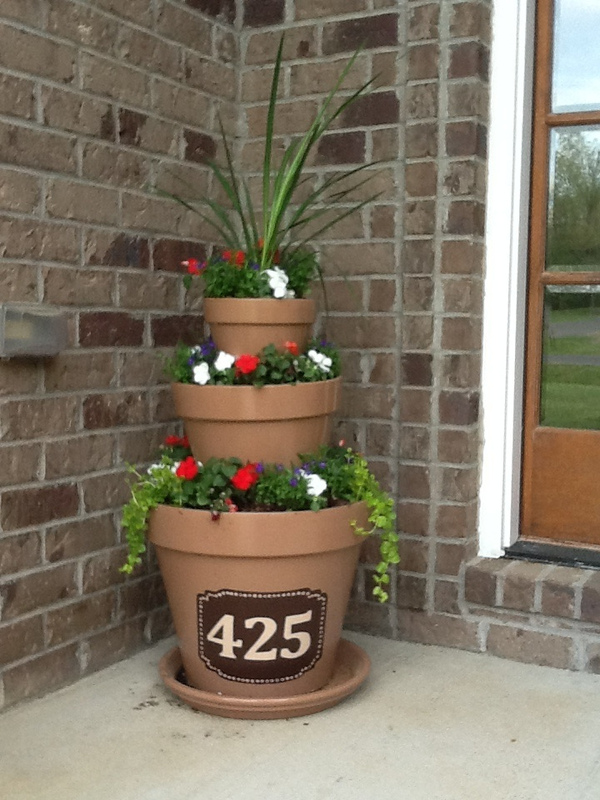 For stately and elegant porch decoration ideas, look no further than the humble planter. A pair of tall urns framing the door makes a statement without being overwhelming or difficult to maintain. 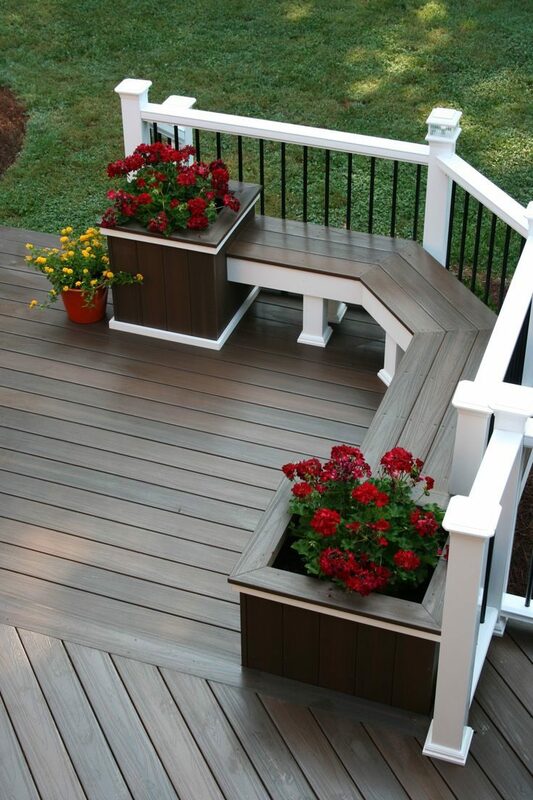 To keep expenses down, choose planters made from composite plastics or resin rather than wood. These will be lighter and easier to maintain, though they may need to be replaced after several years of use. When choosing plants, keep the color scheme simple. A variety of ferns, philodendron, and other greenery provide textural interest, while clusters of soft pink blossoms add a touch of contrast. 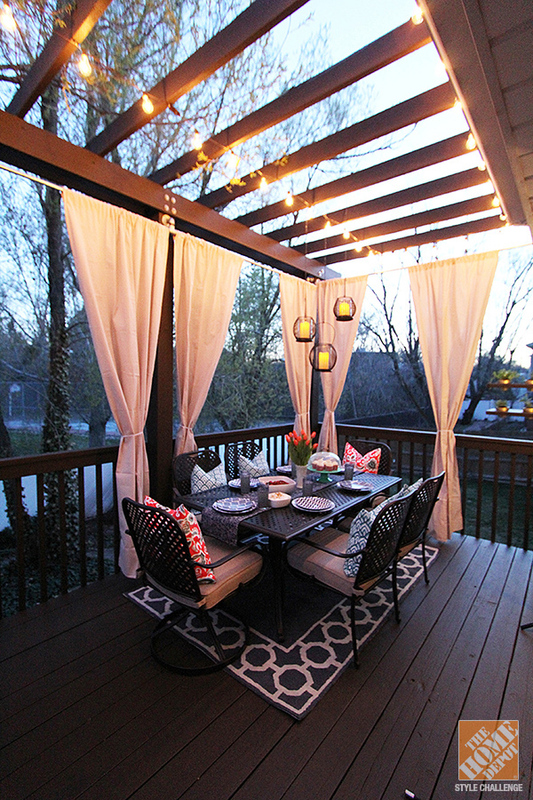 If you love to entertain, an outdoor deck is the perfect space for summer get-togethers. This large deck creates interest and defines different areas by varying the direction of the deck planks. With any raised deck, a railing is a must to prevent accidental falls; bright white corner posts and top rails paired with wrought iron balusters make this railing a design feature as much as a safety feature. Built-in benches provide an easy way to accommodate guests without the hassle of dragging out extra furniture. 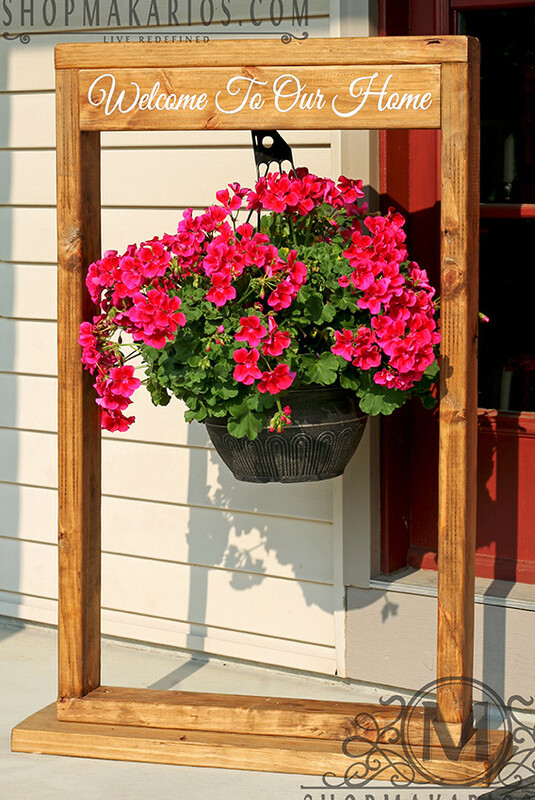 Capping off the ends of the bench with exuberant geranium planters make porch decorating a cinch. Porch decorating doesn’t need to be over the top. Sometimes the right piece is all you need to make a statement, That’s exactly the case with this unique signpost. What better way to welcome guests? With a variety of bright colors, this sign stands out against the house’s neutral colored siding, but gently distressed paint keeps it from looking over the top. 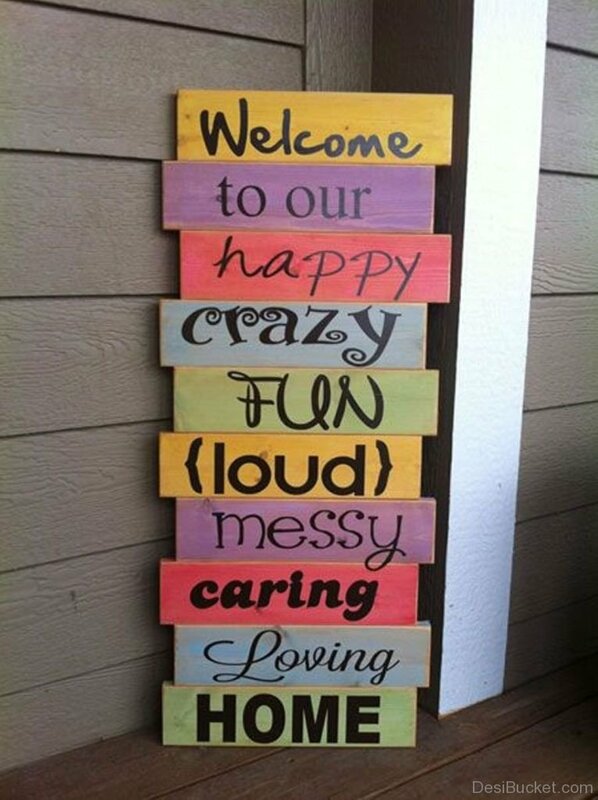 For fans of DIY, a sign like this is an easy at-home project that even the kids can help with. Use stencils or stick-on vinyl lettering for that hand-lettered look without the calligraphy lessons. 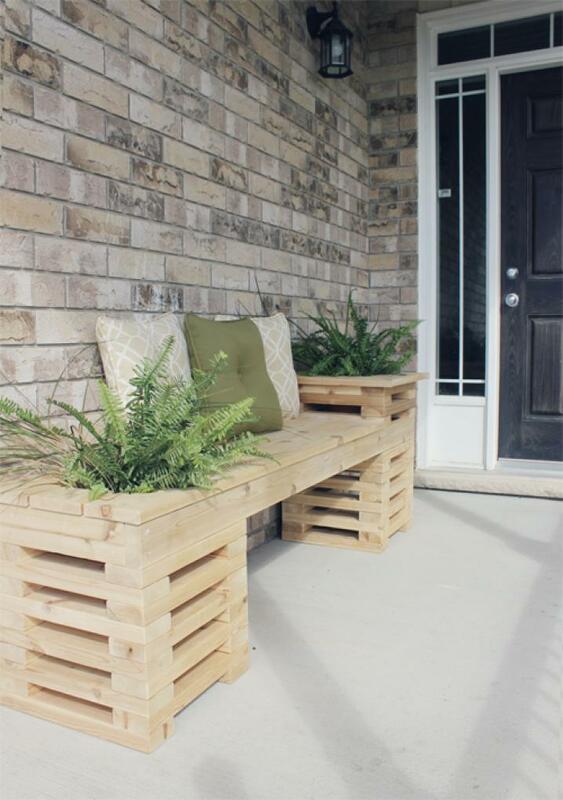 For porch decoration ideas that are both simple and chic, look no further than this planter bench. Believe it or not, it’s made from stacked 2×4 boards, anchored at the corners to keep them from toppling over. With the stone-colored brick behind it and a concrete porch beneath, the natural honey color of the wood provides a subtle warmth to what might otherwise be a stark space. A stack of earth toned pillows and lush ferns spilling from the planters add color and softness to counterbalance the blocky shapes of the bench and bricks. For small spaces, look for porch decor that’s similarly small in scale. Large decorations and furniture, in addition to taking up extra space, have a tendency to make small spaces look even smaller and more crowded. Instead, opt for unobtrusive items. 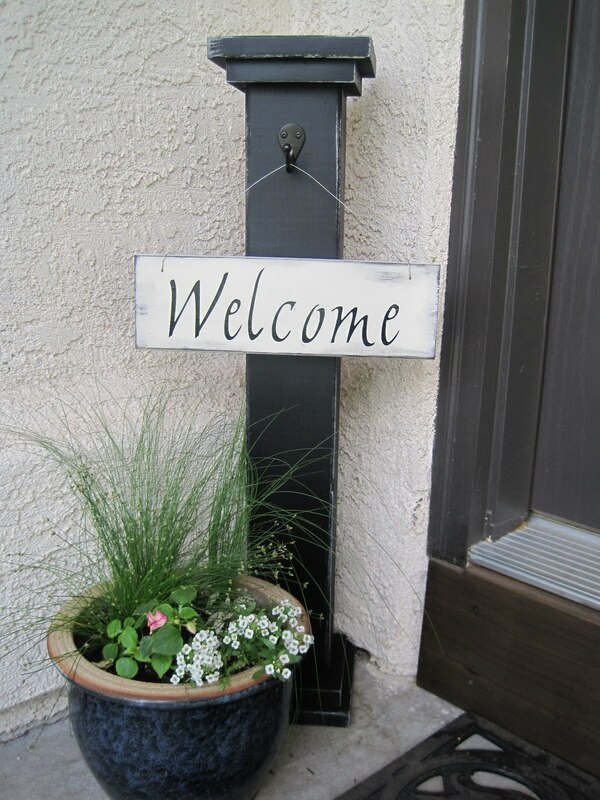 A sturdy square post tucked beside the door serves as a spot to hang a hand painted welcoming sign. This is an easy item to change out with the seasons–hang a plastic jack-o-lantern at Halloween, or a festive wreath for the holidays. Instead of tall urns or bulky planters, a simple ceramic pot with a selection of petite blooms brings life to the space without crowding into the walkway. Take your porch decoration ideas to the next level–literally–with tiered planters. This DIY version uses terra cotta pots in three different sizes to add height as well as color for visual interest. Not only does it liven up the porch with layers of bright blossoms and foliage, it even provides a convenient place to display your house number. 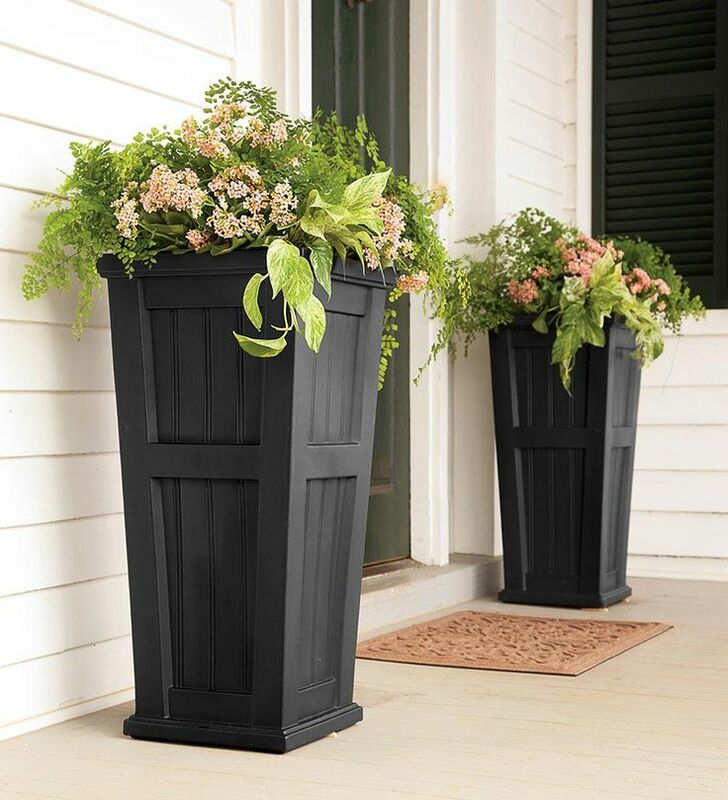 When planning your planters, make sure to take into account how much light your porch gets during the day. Shade loving ferns, begonias, and impatiens will do well under covered porches, while open decks are better for flowers that like full sun, such as geraniums, petunias, and daisies. Upcycled, reclaimed, repurposed–whatever you may call it, what one person sees as junk, another sees as the missing element in their porch designs. 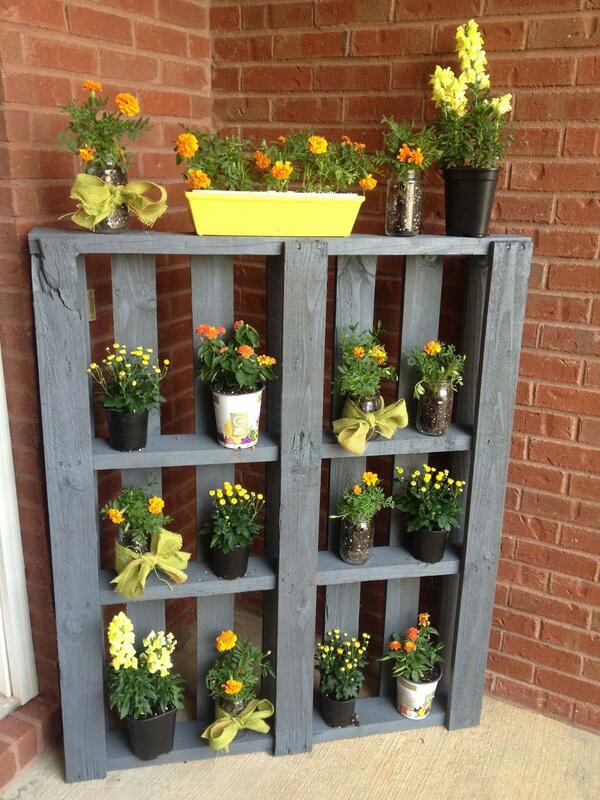 Here, an old shipping pallet transforms an empty corner into a cheerful vertical garden, perfect for making the most of a small porch. Tipped on its side, the pallet’s inner support braces become shelves to hold clusters of mini-planters made from empty jars and other recycled containers. With it’s coat of dusky blue paint, the pallet creates a perfect backdrop for the vibrantly golden snapdragons, marigolds, and other blooms that make up this color-coordinated garden. With a welcome like this, your guests can’t help but be impressed. A free-standing wooden frame combines the personable greetings of a welcome sign with the exuberant blooms of a hanging geranium planter. Unlike shepherd’s hooks or wall-mounted brackets, this plant stand can easily be moved from one location to another, making it simple to change up your porch decoration ideas throughout the season, or add a little extra decor to outdoor get togethers. If you opt to DIY a stand like this, be certain your corners are perfectly square, otherwise the weight of the hanging basket may cause the stand to tip over. If your style tends toward the rustic, or if you happen to heat your home with wood, these adorable stools might be the perfect outdoor seating solution. They’re easy to DIY, with the help of just one powertool: a chainsaw. 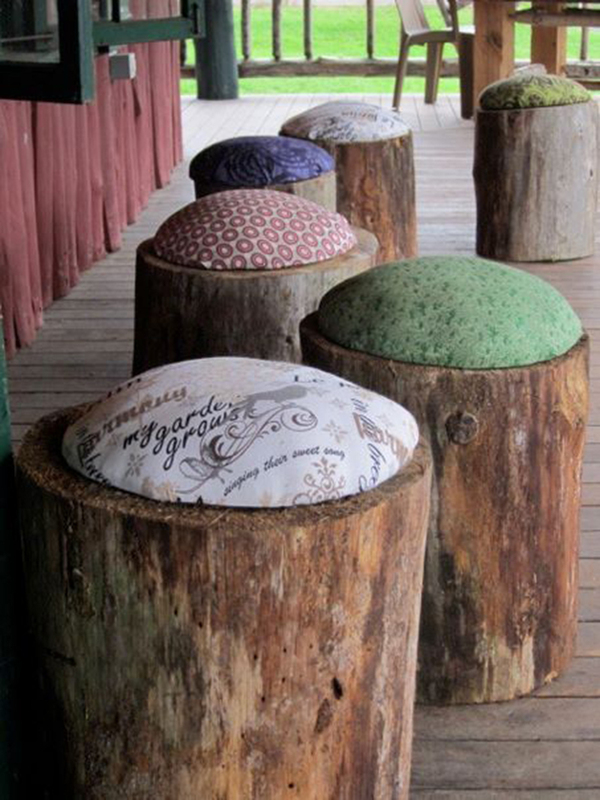 Made from lengths of old logs and capped off by dainty domed cushions, these stools are a great option for a summer cabin or vacation home. Though the logs themselves are solid, heavy design elements, the whimsical mix-and-match cushions adds a touch of lightness and playfulness, as well as some much needed padding. .After all, who says rustic can’t be comfortable? One way to add design interest to your porch designs is by grouping elements along a theme. The theme can be quite subtle; this display of planters and lanterns gets its cohesiveness through its rustic metallic color scheme. Even the doormat plays on old-fashioned wrought-iron designs, but because the shades and textures are all a little different, the design is inviting and homey. 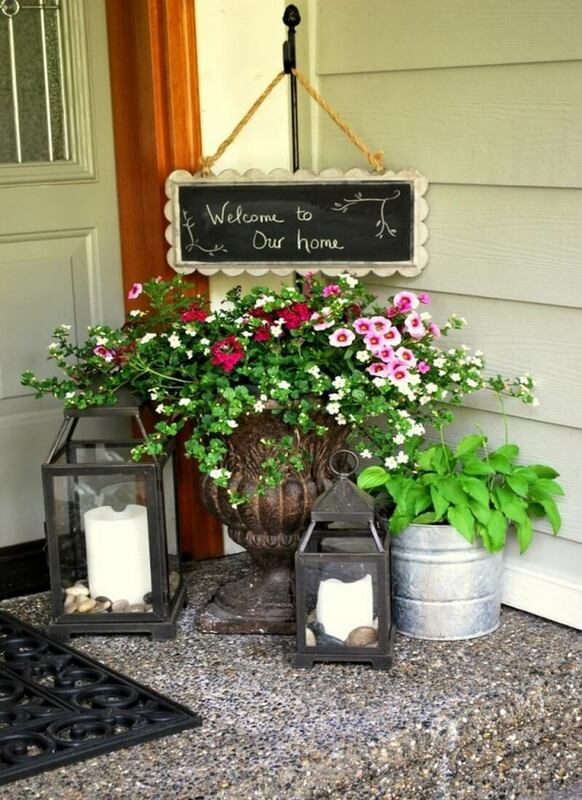 A chalkboard welcome sign is a perfect way to greet guests as they arrive. For special events, add a little mood lighting with candles in the lanterns. If you don’t want to worry about a potential fire hazard, use battery-operated pillar candles for the look of flame without the risk. A few simple porch decoration ideas can really take a bland deck into an exotic getaway. Hanging drapery immediately turns the outdoor space into a room with a view, while an area rug defines space for a dining set that perfectly matches the dark metal finish of the porch rail. The pergola beams overhead make a perfect anchor for the outdoor equivalent of pendant lights–hanging candleholders suspended directly over the dining table. Strands of retro-style outdoor lights add extra illumination to your get-togethers, and with comfy cushioned seating, the scene is set for an evening to remember.